Business established in 2010. Services include transportation to airports, casinos, museums, sports arenas, stadiums and other venues and 4-Star Hotels, situated on the beautiful waterfront, in the busiest part of the city. Great place to work with a magnificent view of the inner harbor. While interacting with guests, some who are visiting the city for the first time, you will feel that you are on vacation, too. Ownership provides flexibility and control. This is a great business, if you like to work at your own pace and make your own schedule. Great opportunity for hands-on or absentee owner. Whether you enjoy driving and getting paid to do so, or hire a driver and receive profits, this could be the business for you. With the tourist sites and attractions, this business continues to increase. 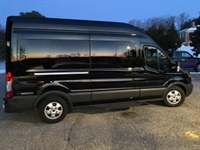 This business has a 2017 15-passenger Shadow Black Van Transit 350, with 3.2L turbo diesel and 6-speed auto SST. Six-year history of profits and satisfied clients. Operating part-time, the current owner is grossing $65,000.00, annually, and has an annual net cash flow of $47,000.00. Lots of opportunities to increase cash flow by operating full-time service.